The film Garth Trek | A Lost Dog’s Adventure in Frankfort is the story of what happens when a dog gets lost in Frankfort and spends the day searching for his owner. This is the revised rendition of the film that took home our Traverse Traveler Choice Award at the 2018 Frankfort48 Film Contest. 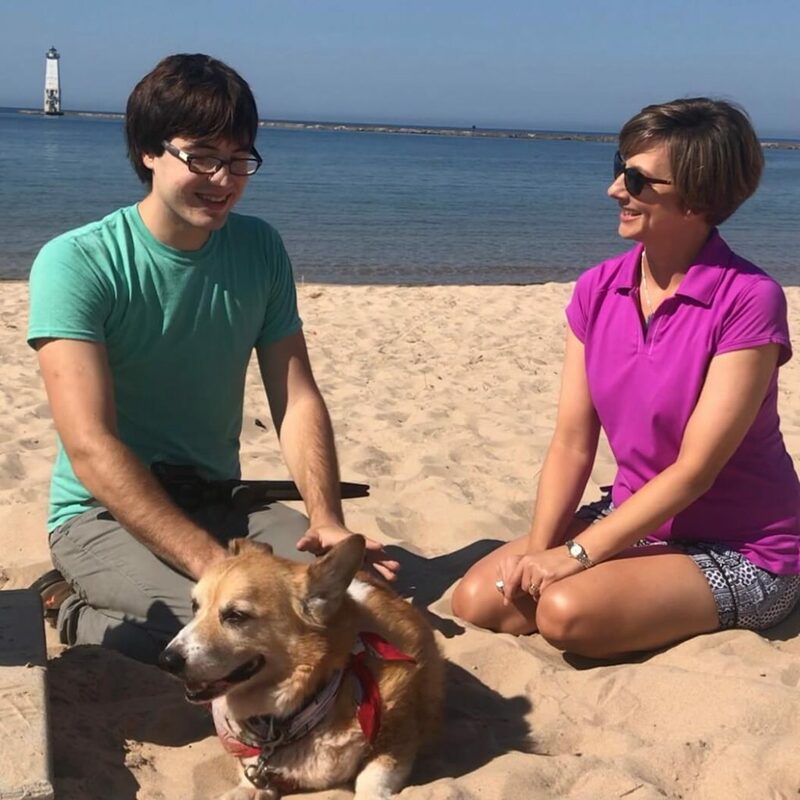 We thought you might enjoy the story of how a dog named Garth wandered his way onto the Traverse Traveler visitor channel. Each year the Garden Theater hosts a contest for young filmmakers. They have 48 hours to write, shoot, edit and submit a 3-5 minute film, with a few surprise elements chosen by organizers. Since we love working with young talent–and we love Frankfort–this seemed like the perfect project to support. We were honored to join the judging committee and select a winner for the Traverse Traveler Choice Award. Along with a prize package, our winner was offered the opportunity to create and edit a commercial promoting the Frankfort48 Film Contest. The commercial will air on the Traverse Traveler Visitor Channel to promote the 2019 Frankfort48 Film Contest. Garth Trek turned out to be a crowd favorite, judging by the applause. We loved the concept of the video, and who wouldn’t love Garth. So we gave T.J. the chance to direct a revised version, and put Garth in spotlight again. Check out the original film on YouTube. The Traverse Traveler visitor channel plays in over 3,000 hotel rooms throughout the Traverse City region. Our programming is designed to educate and entertain hotel guests, as well as provide guidance to area businesses and attractions. We recently added properties in Benzie County to our network, and thought this would be a great way to introduce viewers to Frankfort. To retain the original storyline T.J. kept key shots from the original Garth Trek that we fell in love with. Then we added many new locations and adventures to local hotspots. Finally, we gave Garth a voice. The narration helps travelers watching on our in-room visitor channel follow along with his journey. We think our award-winning director T.J. Taylor, and his team, have earned another round of applause. And a special thanks to their canine star, Garth. It’s time for the annual Traverse City Film Festival. It’s a great chance to discover new movies, attend fun events and enjoy the hospitality of our city. We thought we’d share a few tips on how to be a traveler — not a tourist — during the film festival. Take advantage of the free festival shuttle provided by BATA. The Bayline will bring you into town from your hotel. And look for details about their festival loop traveling between film venues. The buses are all ADA accessible, air conditioned and have wifi. Travelers know it pays to be flexible. If you didn’t get tickets to a movie, try the standby line. You just might get in, even if you don’t get to sit with your friends. Not all the movies are shown at The State and The Bijou. Make sure you know where your movie is playing before you get in line. Speaking of lines, bring a little patience. Don’t be that tourist who thinks lines are for other people. As long as you’re here to binge watch, why not be a traveler and venture out to our surrounding communities and take in a movie at The Garden in Frankfort, the Bay Theatre in Suttons Bay or check out northern Michigan’s only drive-in movie theater at the Cherry Bowl Drive-In in Honor. The Traverse City Film Festival is the perfect excuse to spend the day downtown. Try a new restaurant, grab a drink with some friends, or do a little wine tasting. Our Dining Guide can be a helpful resource if you’re looking to try something new. It’s fun to be a traveler for the day, even if you’re a local. 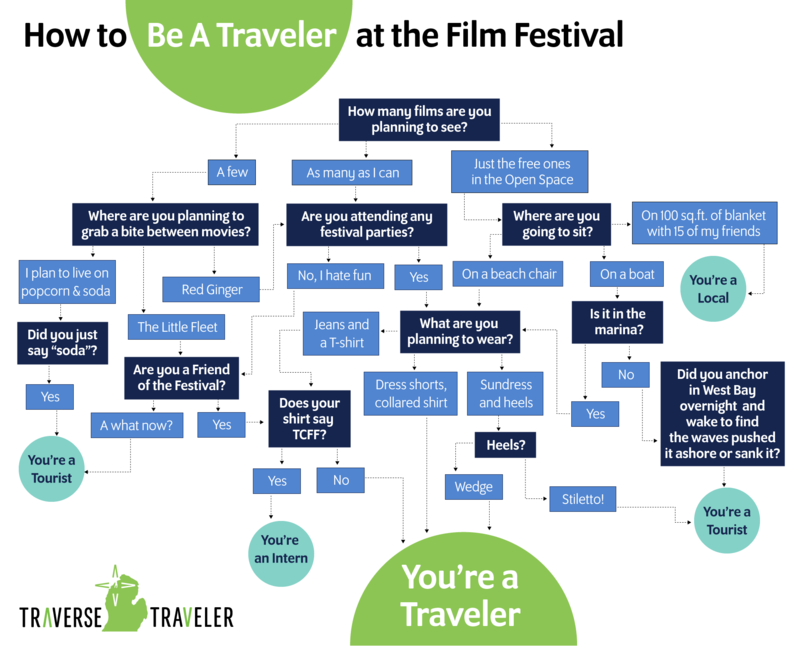 We hope you use our tips to be a traveler during the Traverse City Film Festival. Enjoy the shows! We are excited to sponsor the Traverse Traveler Choice Award at the Frankfort48 Film Contest. The 2nd annual event will take place June 21-23, 2018 at the Garden Theater in Frankfort. This unique contest offers teams of all ages and experience levels a chance to share a story of their creation using the power and beauty of film. We’re proud to showcase this region in film on our Traverse Traveler Visitors Channel everyday. That’s why we jumped at the chance to get involved in the Frankfort48. If you love movies, love making videos, or just love Frankfort, you’ll want to read on. Participants have 48 hours to create a 3-5 minute film celebrating the beauty of northern Michigan. The Frankfort48 Film Contest is open to teams of any size or age, amateur or professional. Registered teams will be given three required elements that must appear on screen: a character, a prop and a line of dialog. They will have from 9am on June 21st to 9am on June 23rd to develop a concept, scout locations, film, edit and submit their film via Vimeo. That’s 48 hours of frantic fun in Frankfort! The contest awards will be determined by an experienced panel of celebrity judges including Michael Bofshever, Jamie Donnelly and Stephen H. Foreman. Members of the Visitors Media team will participate in the judging to select the winner of the Traverse Traveler Choice Award. The Traverse Traveler Choice Award winning film will be featured in a promotional ad for next year’s Frankfort48 Film Contest. The ad will air on our Traverse Traveler Visitors Channel, playing in over 3000 hotel rooms in the greater Traverse City area. We’ll put together a special prize package for the winning team along with the opportunity to take part in the ad creation. On Saturday June 23, 2018 at the Frankfort Garden Theatre the contest entries will make their debut on the big screen. We want to encourage the public to join us at the screening. Check out the amazing short films these teams can pull together in just 48 hours. It’s a testament to the power of film, the dedication of creative minds, and the beauty of northern Michigan… a place we’re lucky to call home. To secure your entry visit the Frankfort48 website. To download the entry form with all the details click here. 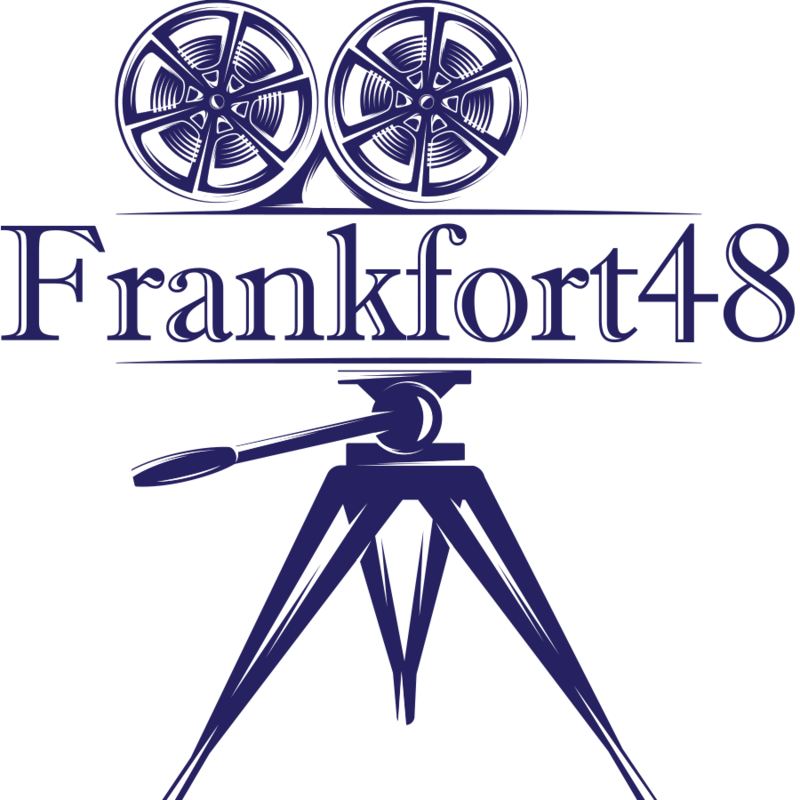 It’s only $25 per team to participate in the Frankfort48 Film Contest. If you’ve got the crew, the stamina and the creativity to pull it off, we can’t wait to see what you come up with. Looking for an easy read to kick off your next adventure in northern Michigan? Support a local writer and pick up 100 Things to Do in Traverse City Before You Die. Author Kim Schneider draws upon her experience as a travel writer and long time resident to share 100 ways to navigate northern Michigan. As a fellow foodie, explorer and consumer of the “best of” this region I was anxious to dive into the pages. I wondered if we would share similar tastes, favorite familiar hangouts or if, by chance, I might learn something new from her recommendations. We tout many of the same places to eat, drink and shop like a local. And we agree on dozens of must-see destinations like Sleeping Bear Dunes National Lakeshore, visiting area wineries and learning how to spot a Petoskey stone. But I was thrilled to discover that I too could pick-up something new in her pages of recommendations. One of my favorite things about the book are the author’s tips shared from personal experiences. For instance, I didn’t know there’s a secret garden on Sixth street welcoming visitors when the sign says “Open”. I did appreciate the reminder that you had better bring cash to Art’s Tavern as they don’t accept credit cards. (I learned the hard way on that a time or two.) And who wouldn’t appreciate the handy reference lists of businesses associated with each suggestion. Like shops that rent fat tire bikes? You never know when you’ll want to try one of those. 100 Things to Do in Traverse City Before You Die would make a great coffee table book for the cottage, gift for the mitten lover in your life, or glove-box reference guide for locals looking to flip the pages and set off on an adventure. 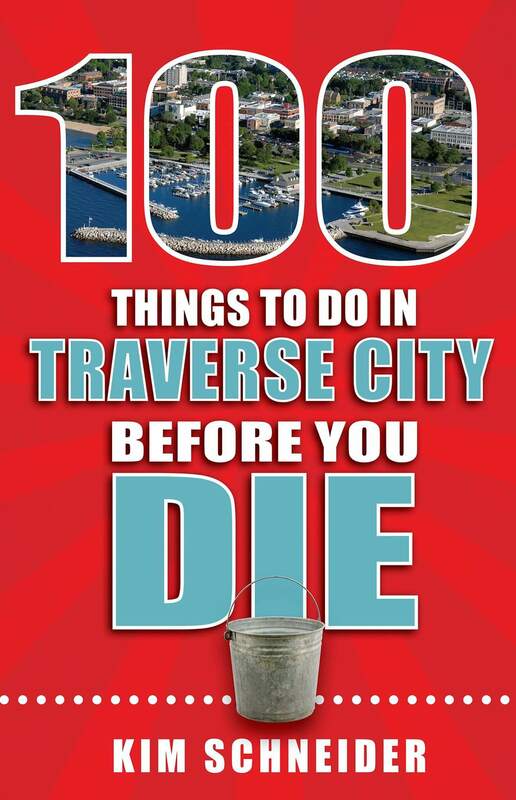 You can pick-up a copy of 100 Things to Do in Traverse City Before You Die at local book stores including Brilliant Books, Horizon Books and Nifty Things in Traverse City, as well as Dog Ears Books in Northport (open seasonally). To meet the author, pick her brain and get a signed copy, why not stop by one of the following launch parties and special events. We love supporting local authors, artists and creators. They are a vibrant part of our community. If you enjoy the topic of this book review and are looking for more food for thought on Things to Do in Traverse City, explore our Dining, Shopping and Attractions pages for inspiration. And don’t forget to download our free Traverse Traveler app. Visit Becky Thatcher Designs in downtown Traverse City this Saturday, April 25th from 1-4pm for ‘Chocolate & Pearls,’ an open house event for jewelry lovers. Get a glimpse of new designs featuring pearls in earrings, necklaces and more. Pearls come in all shapes, sizes and many colors. 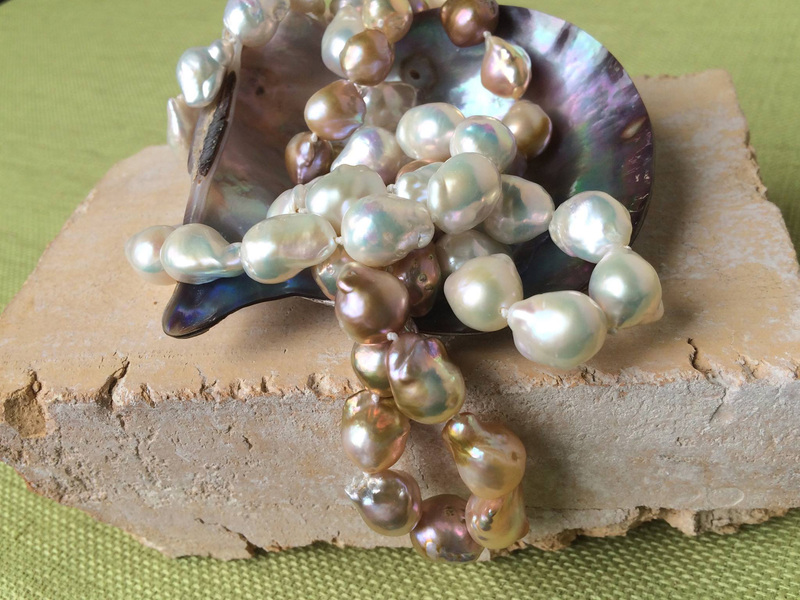 At the open house event you’ll learn about the differences between Cultured, South Sea and Tahitian pearls. Becky will be in store to share her knowledge of these traditional adornments. Browse her displays of creative handmade jewelry or peruse the loose pearls available for a custom design. For a truly unique learning experience ask about the upcoming gemstone roundtable event, where dealers present a collection of gems from around the world. Here’s a peek inside last year’s event. Becky Thatcher Designs is located at 234 E. Front Street in downtown Traverse City, across from the State Theater. A visit to Glen Arbor isn’t complete without a stop at Becky Thatcher’s studio. I’ve been a fan of Becky Thatcher Designs since the first day I walked into her Glen Arbor studio and saw her jewelry displayed in cases filled with birch, sand and stones collected from the nearby Lake Michigan shoreline. A pale purple and blue landscape was painted on the walls, and I felt as though I’d never left the beach. From her petoskey stone watches, to freshwater pearls and signature rings that blend gold, silver and gemstones, Becky has a gift for crafting exceptional jewelry. She has a passion for sharing her knowledge as well. I thought it would be fun to share a piece of her world with you. I asked Becky if I could get a behind-the-scenes look at the world of jewelry design for the Traverse Traveler blog, and Becky had the perfect solution. Earlier this summer I had the privilege of joining a gemstone roundtable hosted by Becky Thatcher and gemstone dealers from Mayer & Watt. Twice each year Becky Thatcher welcomes a handful of guests to join her in experiencing what it’s like to purchase gems directly from dealers who travel the world in search of beautiful stones. This was to be my glimpse behind the scenes of the gem buying process. Our presenters, Simon & Laurie Watt, of Mayer & Watt, are accomplished gem dealers with whom Becky has worked for many years. Simon has served on the board of the American Gem Trade Association for more than 9 years, and Laurie was one of the first three women in the gem business. Becky Thatcher Designs, located on Front Street in downtown Traverse City. Becky also has stores in Glen Arbor, Leland and Harbor Springs. We met at the Becky Thatcher Designs store in downtown Traverse City. A lovely light dinner and refreshments awaited while guests mingled and met our hosts. We sat at a long narrow table carefully prepared for the process of examining stones for purchase. For over 30 years Mayer & Watt have developed relationships with a network of cutters and miners in every corner of the gem world, to bring stones to jewelers like Becky. Fair trade and fair labor are of utmost concern to be sure their products do not fund terror. They specialize in rare and unusual stones, many of which we had the chance to see and to hold. Guests were seated around a long table with Simon at the head. He held a box with dozens of simple paper envelopes inside. We were asked to pass the envelopes around the table one by one. The outside was labeled with the name of the stone, the cut, the carat weight and the price. Since all stones were available for purchase we employed a special process for laying claim to a certain stone. At the roundtable event we viewed over 150 gemstones which ranged in price from $99 to over $100,000. As the envelopes passed round the table each guest carefully opened the paper folds to reveal the loose stone(s) inside. Some were single stones and others were cut and sold as a pair. If one of the stones caught our eye and warranted a second look we called “dibs” along with our name and the number on the envelope, then passed it along. Dibs wasn’t a commitment to buy, “just a flirtation,” said Simon. A chance to see the stone again, handle it, and perhaps compare it to another stone that came along. Guests had an opportunity to view each stone up close as they were passed around the table. To see a stone a second time you call ‘dibs’ and they placed the stone on a tray in front of you. Stones were packaged in a folded paper envelope, numbered and labeled. Each guest had the opportunity to see the stones unveiled for the first time upon opening the final fold. After viewing we passed them on folded inside just as they had been received. I saw amazing gems that evening. Stones I’d never heard of. From Spinel, Chrysoberyl, Nephrite and Alexandrite to the familar Opal, Amethyst, Sapphire and Ruby. But the most unusual name and the most amazing story go hand-in-hand. We waited for the Rhodocrosite. Simon came across this award-winning stone 16 years ago. He offered to buy it and was told to “get in line.” Years went by and he never forgot the beauty of that stone. Just weeks before coming to Michigan he received a call about a special stone for sale. Lo and behold it was one in the same. The stunning Rhodocrosite (shown above) was finally his. You’d think this one would be marked “not for sale” but in the gem business that’s not how it works. The stones are always for sale. “It’s like getting to fall in love all over again,” said Simon. And he hopes someone will fall in love with this beauty. Some stones were presented and sold as pairs. It took hours to make our way through the entire box of stones. We all had fun calling “dibs” to see some of the stones up close. We marveled at the beauty of these treasures and imagined what Becky could do with them in her capable hands. 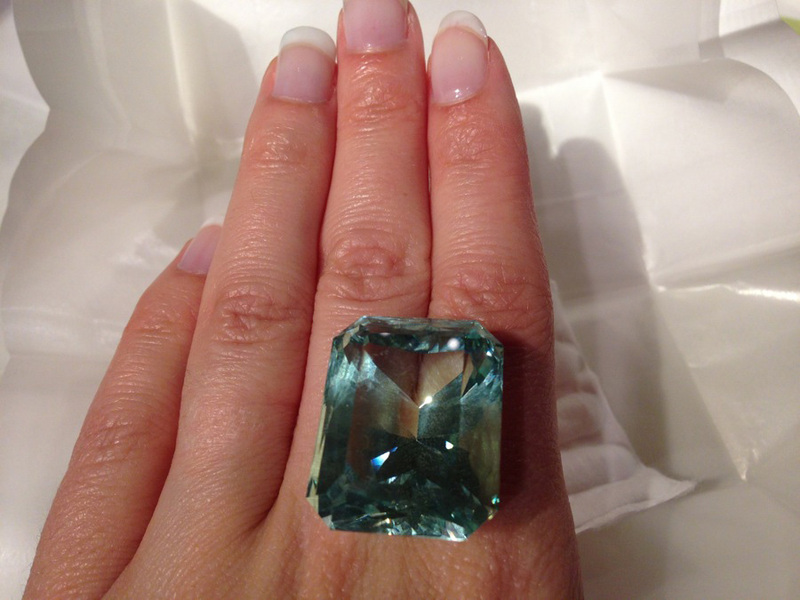 This amazing gem is a green beryl. What a stunning cut, and surprisingly affordable. Attending a gemstone roundtable was a fascinating experience. If you’d be interested in seeing this first hand I’d suggest you pay a visit to Becky Thatcher Designs in Glen Arbor, Leland, Harbor Springs or Traverse City and inquire. Becky will be hosting another roundtable yet this year. It could be a great place to start shopping for Christmas! But wait, there’s more! Have you heard about Becky’s Tuesday Tea & Talk series? Throughout the summer she hosts a formal tea in her private garden behind the Glen Arbor store where Becky’s husband David shares a lecture on gemstones. The topic changes each week. Click here for the Tuesday Tea & Talk schedule and stop by for high tea in the garden and a glimpse into the world I found fascinating. An Up North summer begins and ends on a holiday. That’s 59 days to soak up the sun. So I put together a list of 59 ways to squeeze in every last drop of Pure Michigan fun. This year, let’s all Be a Traveler in Traverse City. On your mark… get set… go! Hunt for petoskey stones. Point Betsie is a good stony beach with miles of shoreline for walking. Not sure what you’re looking for? Pick up a rock hunting guide from Korner Gem. Kevin’s an expert! Watch a movie under the stars. Get a bucket of popcorn with real butter and experience a time warp at the Cherry Bowl Drive-in in Honor. Or check out the Bike-in TC movies in F&M park, and the week-long Traverse City Film Festival with free flicks at the Open Space in August. Sip a cold drink under the warm sun. I love to look out over the marina from the deck at Harbor 22, or better yet… cocktails on a boat, in the harbor will do just fine. Read a paperback on the beach. Ok, so this one makes my list every summer for nothing more than pure selfish relaxation. I’m usually giggling at Stephanie Plum in the latest Janet Evanovich book, but if you’re looking for a new read I’d suggest a stop by Brilliant Books in Traverse City. Buy a flight at a local brewery. Our little town is one of the beeriest cities in the U.S. You’ll find a dozen craft breweries in Traverse City and new ones popping up in small towns, like Stormcloud in Frankfort. So grab a flight and drink local. Bike the T.A.R.T. trail or Benzie trail. Follow this stretch of the T.A.R.T. that runs along Boardman Lake behind the Traverse Area District Library and look for the planetary signs. It’s great fun for the kids. Celebrate our independence with fireworks. We park and walk for miles to Lake Michigan beach in Frankfort with a bag of licorice, glow necklaces and dig our pit in the sand to watch a spectacular show every July 4th. Reel in a king salmon. Forget the worm, up North, the early bird gets the fish! The best bite is at dawn and dusk, but the thrill of the catch is worth it. On a good day you’ll bring home dinner. On a bad day it was a still a nice boat ride that followed the colors of the sun. Fill a basket with fresh picked fruit straight from the orchard. Stop at a U-Pick farm for a hands-on experience or pull up to a roadside stand and select from nature’s best. Count satellites and ponder the stars. The Sleeping Bear Dunes National Lakeshore holds ‘Star Parties’ several times each summer where you can explore the night sky through powerful telescopes. Or kick back next to a campfire and watch for meteors. Try a new restaurant. Our region is blessed with fantastic local eateries. Try one that’s new —or at least new to you— this summer. On my list: The Franklin on Front and Cass in downtown Traverse City and Tucker’s in Northport. Walk barefoot along our freshwater coast. Take some time to feel the sand between your toes on a beach walk. You’ll find busy beaches along the shores of West Bay, Frankfort and Empire, or seek solitude at the end of a quiet road in the Sleeping Bear Dunes National Lakeshore. People watch at a festival. From the National Cherry Festival to the Northwestern Michigan Fair to the Traverse City Film Festival there’s entertainment to be found in the crowd. You may catch a glimpse of celebrity locals including Michael Moore, Carter Oosterhouse and Mario Batali. Buy art from a local artist. Local art makes a unique souvenir from your trip up north. Check out Michigan Artists Gallery in Suttons Bay, Gallery 50 at The Village at Grand Traverse Commons, and Art and Soul in downtown TC. Drink the fruits of our land. The wineries are one of the most popular tourist attractions in the Grand Traverse region. But as a local, I’m proud to say I love them too. Take a trip on Old Mission or Leelanau county and enjoy the fruits of their labor. Before you go, check out my tips for wine-tasting in Northern Michigan. Jump off a dock. Swing from a rope, dive in a pool, take flight over a body of water and land with a splash. That’s summer lovin’ at its watery best. Marvel at a Museum. From unexpected treasures at the Music House Museum, to fine art at the Dennos to hands-on fun at the Great Lakes Children’s Museum, there’s indoor fun to be had in Traverse City too. Run down the dunes. The Sleeping Bear Dunes is a must-visit every summer. From the dune climb that overlooks Big and Little Glen, to the quieter spots in the National Park, find your spot to run with the wind in your hair and legs out of control. Eat dessert from a cone. Is there a more perfect summer food than ice cream? We make regular trips to Moomer’s for homemade deliciousness complete with farm views. But if you want to feel like a local order the Cosmo cone from the Dairy Lodge. Roast s’mores over an open flame. My secret for a perfect s’more: buy the giant marshmellos, roast until gooey, remove skewer and slip two squares of chocolate inside the marshmello. Squeeze between two grahams and enjoy. This will be the most delicious mess you eat all summer. Float down the Platte. Whether you like to bob on a tube, cruise in a kayak or navigate with a canoe, a trip down the Platte from Riverside Canoes is the best way to enjoy the river. Plan to spend some time at the mouth swimming in the warm current as it empties into Lake Michigan. Dinner at the Manitou. After spending my high school and college years as a waitress here I can’t let a summer go by without a trip to the Manitou Restaurant on M-22 near Crystal Lake. No skimping either. Start with the skinny dippers and finish with blueberry raspberry pie. Climb a lighthouse tower. Nothing beats the view from the top of a lighthouse in Michigan. We’re lucky to have several you can climb including the Grand Traverse Lighthouse Museum. Did you know you can see four islands from their tower? Ride the new Heritage Trail. Bikers will want to check out the brand new Sleeping Bear Heritage Trail that runs from the Dune Climb south to Empire. It’s a beautiful new addition to the park. 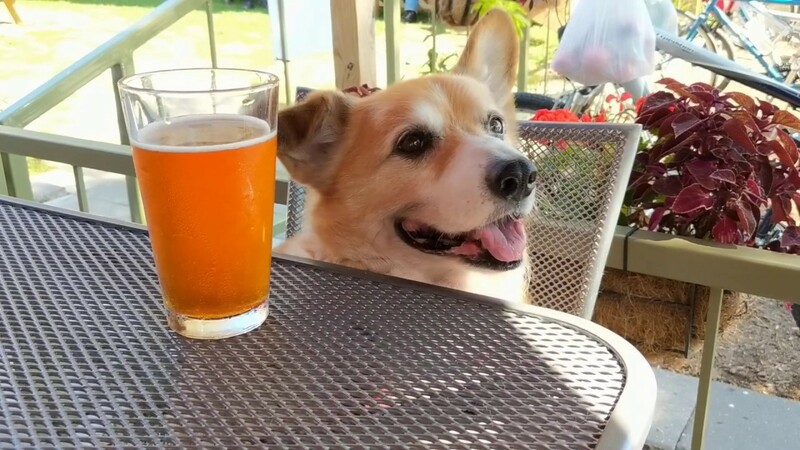 Dine al fresco. I do a lot of grab-n-go dining as I’m on the road. But in the summer I try to slow down for a meal al fresco. Check out the seating at Morsels along the Boardman River for a coffee or snack. Or grab a bite from the food trucks that park at The Little Fleet. Buy fresh fruit from a roadside stand. Cruise up M-37 on Old Mission Peninsula and you’ll find lovely roadside stands all summer selling cherries, peaches, apricots and flowers. Some are washed and ready to eat. Play golf. This region is surrounded by world class golf courses so grab a tee time. My favorite course has waterfalls, pirates and a zipline that traverses over the go-carts. Yep, I’ll be working on my hole-in-one at Pirates Cove. Take the boat to South Manitou Island. If you want to experience true north, the way it was before settlements took hold, then take the Manitou Transit from Leland and visit South Manitou Island. Climb the lighthouse, walk the beach and look for shipwrecks off the coast. Shop around M-22. Some of my favorite summer shops are scattered among coastal towns along M-22. I always sneek up to Suttons Bay to visit The Happy Woman, and At Home, Haystacks has my favorite skirts, and check Wildflowers in Glen Arbor for great garden gifts and fun jewelry. Photograph a sunset at Point Betsie Lighthouse. The most photographed lighthouse in the state, Point Betsie is an iconic subject for so many reasons. Catch the light at sunset, with waves crashing along the sandy shore… it’s a moment worth capturing on film. Pick blueberries. It could be strawberries, or cherries, but every year I say I’m going to pick blueberries from one of the farms on Old Mission or in Benzie County but I never make it! This is going to be the year. Visit the Crystal Lake Alpaca farm. Along Grace Rd between Benzonia and Frankfort you’ll find the Crystal Lake Alpaca farm. Bring the kids to pet the animals, and bring your wallet to buy some of the amazing clothing and gifts they make on-site. Drink from Mineral Springs. I don’t know if this makes you a tourist or a traveler. But every year my family drinks from the Mineral Springs in downtown Frankfort. Drink for tradition, drink for good health, but hold your nose. I still don’t like the smell. Learn about our legends and lore. Our native American heritage fills this region with legends, artifacts and traditions. Spend a day at the History Center, or Eyaawing museum near Suttons Bay to learn about our native cultures, and the people who built these communities. Find a secluded beach. Most days I’m happy if I can squeeze my towel in between beach goers from all different states, and watch families enjoying the shoreline. But somedays I seek a quiet place to walk and think. Find a happy stretch along the shore and relax. Set sail on Grand Traverse Bay. Kids will love to help hoist the sails aboard the Traverse Tall Ship Manitou that cruises daily on the bay. Looking for dancing and cocktails? Check out the Nauti-cat. And if a romantic sunset is what you seek, set sail aboard Scout. Take a behind-the-scenes tour. Whether you’re a foodie, a history lover or wine geek there’s a tour to be had if you ask. Sign-up online for a tour at the Grand Traverse Distillery or take an historic tour of the old state hospital grounds at The Village at Grand Traverse Commons. Listen to a concert at Interlochen Center for the Arts. We are so blessed to have a world renowned school for the arts in our woodland backyard. Once you’ve listened to an Interlochen concert at Kresge with the summer breeze on your shoulders and music in the air, you’ll make sure this is on your list every year. Catch up with old friends. From backyard BBQs to campfires to a night on the town summertime is my favorite time to schedule time with old friends. Each year I meet my college roommates for at least one weekend of out-of-town fun. Make new friends. 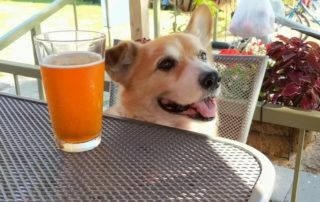 When you sit down at the bar for a cup of coffee, or are waiting in line at a popular restaurant, strike up a conversation with the person next you. More often than not I’m amazed by our connections and what a small world this really is. Tour a local art fair. From craft fairs to fine art juried shows, there’s an artfair somewhere nearly every weekend in the summer. I never miss the Frankfort art fair in August, but not just for the art. I’m in love with the chicken dinners they cook in the park. Best Chicken EVER! Boat party at the sandbar. The party crowd heads to Torch Lake where the sandbar is legendary. But the locals? We hang at Power Island when the beaches get crowded. Don’t have a boat? No problem. Hitch a ride from Bowers Harbor over to Power Island on the new transit and you’ll find pop-up parties all summer long. Get soaked to the skin in the warm summer rain. Surprise your kids, and perhaps yourself, when you throw logic and reason out the window and dance in the rain. No umbrella, no shoes, just pure spontaneous fun. I promise this will bring a smile to your face on a rainy day. Pick a bouquet of wildflowers. Baby’s Breath, Queen Anne’s Lace, wild Thistle, there are dozens of lovely wildflowers growing along the roadside. Pick up a field guide to help identify flowers, rocks and animals found in northern Michigan. Just be sure you don’t pick anything protected. Watch a ball game. Traverse City has the Beach Bums to quench our thirst for America’s pastime. Their beautiful stadium just outside downtown Traverse City is fun for the whole family. And every game finishes with fireworks. Visit Fishtown. Browse the quaint shops that line the century-old fishing wharf, pick up some smoked whitefish from Carlson’s, have a Chubby Mary overlooking the falls or grab a pretzel bread sandwich from the Village Cheese Shanty. A day in Leland’s fishtown is a summer must-do. Tell stories around a campfire. Beach bonfires, campground fires surrounded by tents, patio hearths with potbelly stoves, pick your poison and enjoy one of summer’s iconic experiences. I like mine on the shores of a lake telling stories of summers past. Shop the farmers market. We are blessed to live in an agricultural paradise. And that’s never more apparent than on a trip to the farmer’s market. Every town has them. Eat cherries everyday! Well, maybe not that often. But when you live in cherry country why not enjoy it? Benjamin Twiggs has everything Cherry so you can shop to your heart’s content. And if you just want a sweet cherry treat: stop by Reflect Bistro inside the Cambria Suites for a cherry bread pudding that’s to die for! Party in the street. Wrap up the week with an evening at Friday Night Live in downtown Traverse City. Buy a balloon, enjoy live music, have your face painted. A perfect place to be a kid again…or bring one. Savor a simple homebaked snack. The smell of warm bread or cookies coming out of the oven is delicious any time of year. If I walk into Pleasanton Bakery I’m walking out with their Parmesan Olive bread and one of the fudgiest brownies I’ve ever tasted. So much yum! Get out on the water. Hop on a boat or a jet ski and ride out to where the deep water lives, clear and blue green as far as the eyes can see…and dive in! That is pure Michigan bliss. Eat your fill of fresh sweet corn. Nobody beats Hall’s farm on North Long Lake Road in Traverse City. For a fabulous summer salad try this corn and blueberry salad. It’s great served like a salsa with tortilla chips too. My secret potluck party weapon. Photograph the everyday moments. It’s not the parties and holidays that spark nostalgia but the details of summer memories past. Capture the special places, people and things in your life. You’ll thank me later. Play a sport on the lawn. Badmitten, croquet, bocce or new favorites like ring toss and bean bag games make fun family competitions a must-do for summer. For an entertaining contest try shooting ping-pong balls off of golf tees with rubber bands. Spend a hot day at a cool pool. My kids love the outdoor pool at Waters Edge at Crystal Mountain and can’t wait to try their new ropes course that lies above. Or you could stay and play at the Great Wolf Lodge in Traverse City, an indoor waterpark resort. Explore The Village. Wander the old state hospital grounds inside the Grand Traverse Commons, also known as The Village. Sip wine or cider at Left Foot Charley, pick up some Michigan gear at High Five Threads, or walk the trails that wind all around Traverse City’s version of Central Park. Watch a movie at an historic theater. Our community is lucky to have several renovated theaters back in action. The State Theatre in Traverse City, The Garden in Frankfort and the Bijou by the Bay (formerly the Con Foster Museum). Restored classic theatres where the movies are great, and so are the prices. Eat, drink and shop local. Summer is the absolute best time to enjoy the bounty of northern Michigan and support the businesses that thrive on the extra traffic. So eat at a local hotspot, drink our wines and beers, and buy something that will forever remind you of this summer. The summer you spent enjoying EVERY DAY in this beautiful land of ours. I’m Brandy from Traverse Traveler, and this is my list. I hope you’ll find something on it to add yours. If you have a favorite that I’ve forgotten, please add it in the comments. I love to discover new ways to enjoy this community. Happy Summer everyone! Living in the heart of the M-22 corridor I’ve seen it through all seasons. Each has something amazing to offer, but none more varied and beautiful than autumn in Northern Michigan. © Copyright 2019 Traverse Traveler. Traverse Traveler is owned by Visitors Media, LLC.